Cocktail-wise, Craig–who’s now our official bartender–has two drinks up his sleeve. The first, a Sidecar, I wrote about a few weeks ago. 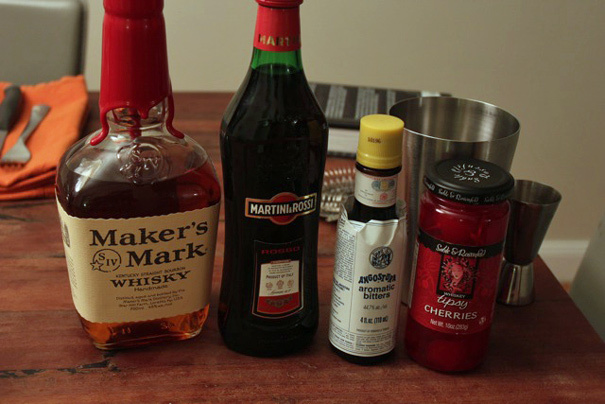 Now he has a new one, perfect for these chilly-weather months: a Manhattan. The P.D.T. book calls for Wild Turkey Rye whiskey, but Craig is a Maker’s Mark kind of guy (he even drank it on our first date, almost six years ago; we went to Lucien in New York and at the bar, he ordered a “Maker’s Mark on the rocks” and I followed suit, not even sure what it was–I thought it was a kind of cocktail; needless to say, if I’d been more sober that night, I’d be engaged to Ryan Gosling today) and when he orders a Manhattan he usually orders a Maker’s Manhattan. 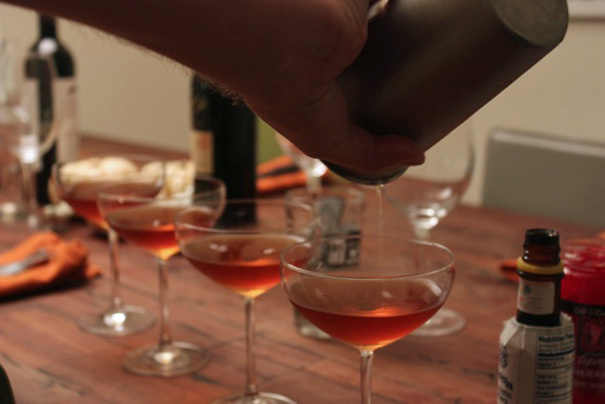 That’s all there is to a Manhattan, a good choice for your next holiday gathering. It goes particularly well with chopped liver.